We will use the Prime Focus Spectrograph (PFS) to track the growth of galaxies and supermassive black holes from the dawn of time to the present day. All telescopes act like time machines; because of the finite speed of light, we see distant objects as they were in the past, allowing us to observe the history of the evolving universe directly. While most spectrographs are tuned to take us back to a very specific point in cosmic history, PFS is sensitive to galaxies at all distances, and will reveal galaxies at all phases in the evolution of the universe. Because it can study thousands of galaxies at a time, PFS will allow us to derive a rich picture of the life cycle of galaxies. Using PFS, we will focus on some of the most important unsolved problems in the history of galaxies. First, we will study the most active period in the history of the universe, when star formation activity and black hole growth were at their height. This window in time, roughly 2 billion years after the Big Bang (or 11.5 billion years ago) has been historically very challenging to study, and thus no large-area surveys of this epoch exist to date. With PFS, we will study the star formation histories of galaxies, how gas flows into and out of galaxies to fuel new star formation, and the growth of the black hole at the galaxy center. We will relate these topics to the larger-scale environment of galaxies in the cosmic web. We will learn about the physical processes that shaped galaxy growth at an unexplored epoch in cosmic time. Second, we will study some of the first young galaxies that formed when the universe was less than a billion years old. We are explore how these galaxies formed and grew and how the first stars impacted the gas around them. Prior to the formation of these early galaxies, the universe was dark. However, the energy from early stars lit up the universe and excited the gas that lies between galaxies. 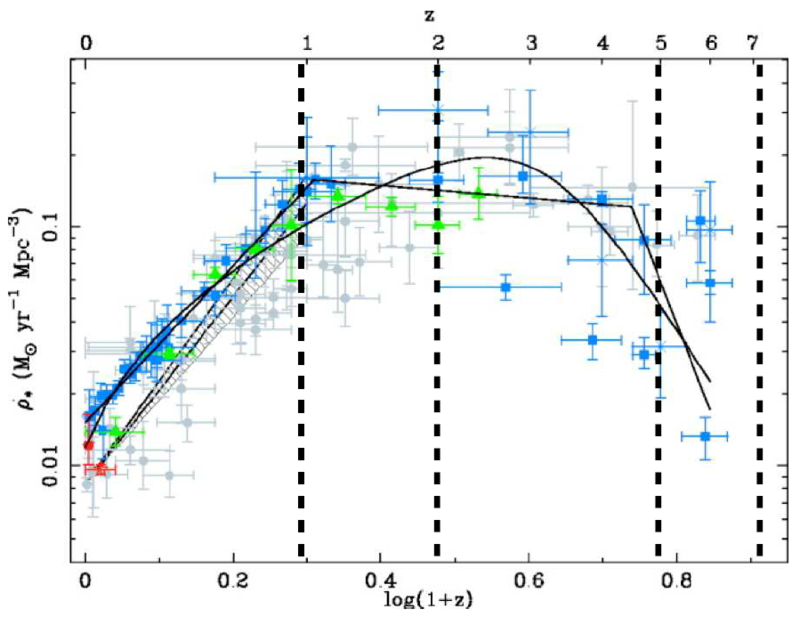 How and when this happened is a major unsolved problem in galaxy formation, but PFS’ survey of large numbers of the earliest galaxies will allow us to trace the history of the so-called cosmic reionization. Third, we will investigate the earliest massive black holes to have formed in the Universe. Astronomers have discovered a small number of black holes with masses several billion times that of the Sun that existed when the Universe was less than a billion years old. We have a very poor understanding of how such extreme objects formed so quickly. The PFS will discover many more such objects, shedding light on whether our theories can explain them. PFS will allow us to study galaxy populations in unprecedented numbers over most of cosmic time, and thus paint a complete picture of how galaxies grew to look how they do today. 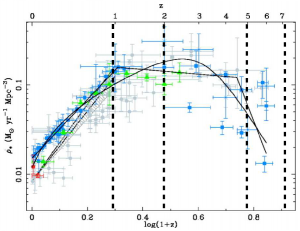 Star formation rate per comoving volume as a function of redshift (Hopkins & Beacom 2006). Different symbols show measurements made at different wavelengths. The solid lines show parametric fits to the data (refer to Hopkins & Beacom for details). The PFS redshift ranges are shown as black dashed vertical lines.